With 3.6 sqm of photovoltaic cells giving an exceptional yield of 21%, and covered by a film composed of nano-prisms enabling denser concentration of solar energy, Astrolab is the first high-performance solar vehicle to be commercialised in the world. Capable of working with very little energy (16 kWc motor) and of recharging even when in motion, this vehicle of another era does not need to be permanently exposed to the sun in order to move. 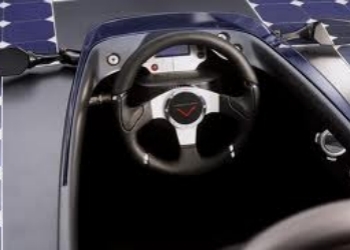 Its last-generation NiMH Venturi NIV-7 batteries – liquid cooled – in fact enable it to restitute stored energy, whether solar or from the electricity supply, making it the first electro-solar hybrid vehicle. With a top speed of 120 km/h and autonomy of 110 km, Astrolab is a real “Solar Commuter” making extensive trips on a daily basis. This is very first vehicle that consumes no fossile resources in order to work : the emissions of CO2 required for its construction will even be compensated for by evironmental actions. A parallel can be drawn between Astrolab and a sailboat : both advance silently while making best use of the elements provided by Nature. And the piloting of both makes for sensations unlike any other. To attain this level of performance while using very little energy, Astrolab has been designed like a Formula 1 : its carbon monocoque chassis is ultra-light and serves as an oversized protection cell ensuring the safety of its occupants in the event of a collision. Its profile recalls the aqua-dynamic design of great racing yachts. 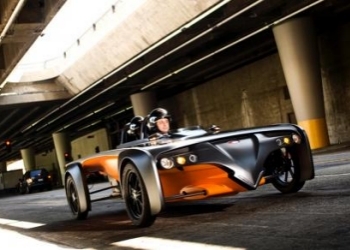 Venturi says the vehicle can recharge itself while in motion and can store solar energy in its nickel-metal-hydride batteries. With a top speed of 75 mph and a range of 68 miles, the Astrolab is intended primarily as an inter-city commuter — albeit a fairly expensive one.